I have only one regret during my KK trip and that is, I failed to taste one of the most unique fruit in the world - the tarap fruit. Found only in Borneo, this fruit which is also known as marang, has a strong scent, is delicious, sweet and soft flavoured. From the outside, it looks like a durian except that its spikes are not hard but are more like soft bristles. When opened up, it resembles a nangka (jackfruit) or a cempedak fruit. But according to Sabahans, the tarap fruit taste much better and more superior compared to both jackfruit and cempedak! Before I went to KK, my friend from Sandakan who currently stays in KL kept reminding me to try the tarap fruit. She said that since coming to KL, she had been missing that fruit very much! Which makes me wonder, why is it not found in Peninsular Malaysia? What makes Sabah and in fact the whole of Borneo so special that the tarap trees only grow there? Anyway, during my holidays in KK, I had tried to search for this fruit. The problem with this fruit is that it is a seasonal fruit. Like the durians. It is not available all year round. And what is worse is that different parts of Sabah have different seasons for this fruit! My search for the tarap fruit brought me to many places - to the fruit markets, the night markets and even to the Sabah Tourism Board! Yes, I even went to the extent of visiting the Sabah Tourisn Board to enquire where I could get the tarap fruit! Now you know how desperate I was! Haha! 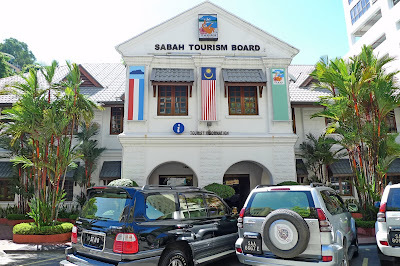 The Sabah Tourism Board is located on Jalan Gaya, one of the most busy and famous streets in KK Town. 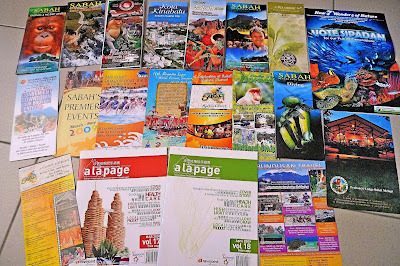 When I went in, I saw rows and rows of brochures and leaflets on Sabah tourist attractions. I took a whole bundle of those brochures! Well, they are free! Haha! I then went to the counter and enquired about the tarap fruit. The friendly lady at the counter said that unfortunately, the tarap fruits were not in season in KK at the moment. That's funny because other people I asked told me they were in season. But if they were, how come I could not find them at fruit markets in KK? According to the lady, the tarap fruit would most likely be found during the month of September. But ...and here's the good news... I could try the Central Market. She could not give any guarantees but said I could try to find it there. She even pointed out to me the exact location where the fruit is sold in the Central Market, which is at the west side corner of the Central Market building. Thanking her, I went to Central Market which was located opposite KK Plaza on Jalan Tun Fuad Stephens. Walking through the rows and rows of fruit stalls, I was hoping to finally find that elusive tarap fruit! If the seller would somehow attempt to sell the tarap fruit to me at double the price, I think I would buy it without a word! Oops! This photo below looked blurred. I think I was too excited about the prospect of finding the tarap fruit that my hand shook when taking the photo! I asked a few sellers there where I could get the tarap fruit and they said it was not in season. But one lady told me she actually saw a few tarap fruits being sold in one of the stalls a few days ago. I was excited and begged her to bring me to that stall. She was kind enough to bring me there but the stall owner said he had already sold off all the fruits! That was such a big disappointment! No one could tell me where else to get the fruit. However, I think there is one place where I am quite sure I could get the tarap fruit. But unfortunately, I did not go there! According to the people at Lavender Lodge where I stayed, the tarap fruit could be found at the Nabalu fruit market along the way to Kinabalu Park. 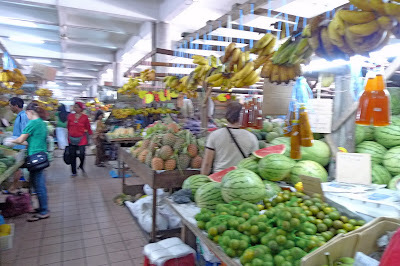 The chartered van which took me to Kinabalu Park did not stop at the Nabalu fruit market. 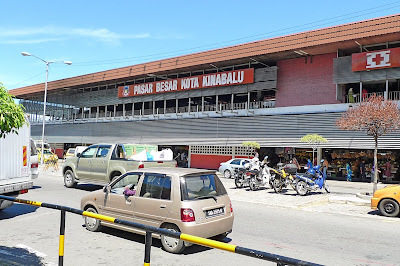 I am quite sure if I had followed tours to Kinabalu Park, they would have stopped us at the market before proceeding to Kinabalu Park. Oh well....no use crying over it now. Perhaps, next year, if I were to go climb Mount Kinabalu, I will get another chance of finding that elusive tarap fruit. Oh..so this is the tarap fruit. It looked like cempedak! Never mind, can always go there in September kan? After your Guilin trip... is in Jul/Aug? I have only seen the photos of tarap fruit. Yeah, It looks like durian, Hope I have chance to taste! Next time, taste fruits and not just snap pictures of it. =P It must be really good having said it's better than Langka (Phils) or jackfruit. Ooooh looks tempting! wonder if it is as soft as Durian. Well, there's always next time! Now that you know it will be in season in Aug/Sept. Hee~ Maybe then, there will be more tourist around the area then :P.
Really that nice? Never try before. Look so like cempedak. Need to try if got chance. wow. the central market looks very clean! love tarap a lot! though it still comes second compare to durian. ;) so this is how it is spelled. tarap fruit looks like a cempedak. I'm curious as to how it tastes too. I too missed something when I was in Sibu. Olives. Only realised it when we got back. We were so close. We were having breakfast in the market. Aisehman! That fruit sure looks interesting - moist and inviting. Would love to try that too. That's a whole bunch of colorful brochures, Foong. The fruits section looks huge. Is it? I was just wondering if it's possible to get this fruit over here? I would like to try to see the difference. If you plan to climb Mount KK next year, make sure you book early. As early as this year. Yes...out of the three in the family - nangka, cempedak and terap...I like buah terap the best. But ours in Sarawak are smaller - like a bowling ball or smaller...but once I saw in Sabah, on my way back from Ranau to KK, somebody with one as big as a nangka (jackfruit). Really big! Did you looking for the red meat durian as well? Yes not yellow or orange but RED... it is unique to Sabah too. oh if it looks like durian does it smell like durian as well??? but then that makes durian unique fromthe others right?? I have yet to see the actual tarap fruit! But yes, it does look like cempedak, except that the flesh is white and not yellowish like cempedak. Are you sure I can find it in Peninsular Malaysia? I don't think so cos I have never heard or seen anyone selling it. Even my Sabah friends staying here could not find the fruit here. el@i, oh, you have tarap in Philippines too? I thought it's only found in Borneo. I guess Philippines is not too far away from Sabah. How come Peninsular Malaysia don't have this fruit? xin, if I ever find the fruit, I will definitely share with those who have not tasted it before. But if it's really nice, maybe that's not possible because I'm afraid my gluttonness will overpower me! LOL! borneo falcon, thanks! I like to go the distance for something that I want. Haha! too bad the fruit was not in season. :( otherwise, i bet you could smell the ripe tarap when you walk around town. dropping my EC here and happy weekend. happysurfer, I haven't been to Sibu before. Must go there one day and try the olives! Haven't tried that before... looks like this is something we must try when in Sabah... anyway any idea if this is also available in Sarawak? SK, what?! You don't eat durians? It's my favourite fruit and food! I just wonder whether tarap will beat durian in my list of favourite fruits. Haha! che-cheh, yes I think there's a place called Marang, though I have no idea where that is! LOL! Yes, I know about booking for Mount Kinabalu climb early. So I will book it by November this year. But the people at Lavender Lodge said I could book it through them a few weeks before I go KK cos they would be able to get a place for me at Laban Rata from those people who canceled last minute. benedict, it has a stronger smell than durian? I love the smell of durians and cannot understand why some people hate the smell so much! So is the smell of tarap nice or not? If nice, that'll be great! Oh, you tried to smuggle the fruit back to West Malaysia? You mean, they don't allow you to carry the fruit in the plane? I thought they only don't allow durians! Then how do I bring back the tarap fruit from KK? With the shelf life of the tarap so short (only 2-3 days like you said), then it's quite difficult to bring the fruit back to West Malaysia. That means must buy it on the day I leave KK and not earlier. bluedreamer27, I don't think it smells like durian. It's more in the cempedak family than the durian family. neo, yes I think this is something we definitely must try in Sabah! According to suituapui, the fruit also available in Sarawak, but smaller in size! You'll get that fruit on it's season, don't worry then share us about it. You love durian? I can't eat it even in candy or pastille form. The smell is something I can't take. I know it tastes good but somehow the smell overpowers it. Foong, I think I tried that fruit already but it's called by other name in the Philippines. Looking at the picture closely, I kind of remembered mom gave me something like that (long time ago). It was good but I guess Langka or Nangka is just my fave. The tarap fruit looks very tasty. Unfortunately not in season. You can leave a self addressed DHL courier box with the fruit stall owner, and he can send to you when it is available....ha ha ha! But then, the smell might make the parcel very suspicious! looks like yr tarap fruit is becoming tarak ( tiada ) fruit hahahah. wish u better luck next time. i must admit that i never seen or heard this tarap fruit before....wow, look like cempedak leh. it is expensive? I wonder if that tarap fruit exists here in the Philippines. Or could it have another name here. I wish I could find out! That fruit looks very good!~ Maybe you can travel there again and find it I hope! It looks like cempedak, only that the fruit is white in color. I also never tried that before. oh Foong you couldn't get the fruit! yeah how come Peninsular Malaysia don't have tarap!? I missed tarap...yum! yum! Anyway you went to the pasar to search for the Elusive Tarap Fruit? Sounds very "geng" wor! Too bad you can't find it. Perhaps the big nose monkey already makan it. Hey.. so happen to view your blog.. 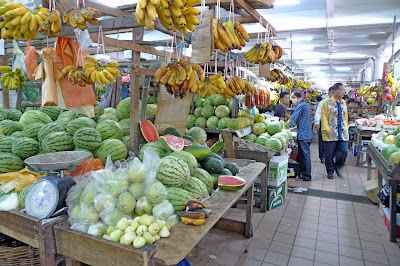 I've been to this pasar in KK as well, during my business trip 2 years ago..
My intention to this pasar is to get some food.. but suprisingly I can't find any similar hawker food there as KL..
jam, I thought tarap fruit can be found in Sarawak? monica, I'm sure you miss the fruit cos all my Sabah friends miss it badly! I heard that even in Sabah, the tarap fruits are getting less and less because they are growing more oil palm trees instead. What a pity! Maybe you should try to grow the tarap tree here in KL! tekkaus, no need to wonder lah. Mei Teng not only FC on my blog but a lot of other blogs! She's now a professional FC chopper! Haha! anne saw, yeah they don't have hawker food like those in KL in this market. Did you get to try the tarap fruits? I saw el@i's comment after posting, she's right it's marang. That's the same fruit mom gave but nangka still won my heart! ayie, you don't like tarap because it has a strong smell? I see. Well, for me, I like strong smells as long as they are nice smells to me. haha! what? I should try to grow the tarap tree here in KL, Foong? LOL!!!! Hi Foong! I've been gone from blog hopping for a long time. :o( I just felt that I needed a break/breather from EC dropping and blog hopping. It started to be a chore, if you know what I mean. monica, why not? You have a garden? Then when the tree bears fruit, invite me to go over to your house for makan! Haha! Besides, if the tarap can really grow over here, then we've proven that it can be grown here. No need to go all the way to Sabah to enjoy the fruit! Enough to pay for your monthly house rental and/or everything else! Haha!! babette, I can understand. Sometimes we need a break. Btw, I don't do much EC drops nowadays. Sometimes I don't think the effort is worth my time cos I've limited time. But I still blog hop whenever I have time cos I still enjoy reading blogs! So strong smell? I don't mind if the smell is nice! But I think will have difficulty if I need to bring it onboard the plane - sure get confiscated! Haha! Hey Foong could try one of the tamus actually like in Penampang. And oh if you like Durians, man you should try the red and orange ones from Kuala Penyu. You only get it once a year...I'm not too sure when but I think around June-ish and wow, the taste! Yum! rozella, where is Penampang? Is it far from KK? And where is Kuala Penyu? Btw, is the red durian better than the D24 and the more expensive Musang King? Penampang is like a 20-minute car ride from KK. Kuala Penyu is like 2 1/2 hours away. Yeah, I would think so. It's durian kampung lah. And it has this slightly bitter taste which I love...but I guess it depends on the individual also lah. some people call this fruit, heaven fruit...because of it smell..pergggh..the smell is more powerful than durian .^ _ ^..